Linda Carlson writes for IBPA’s Independent magazine from Seattle. She can be reached at linda@ibpa-online.org. Founder Joe Dannis attributes that strategy to the late Jan Nathan, IBPA’s first and long-time executive director, and it’s a strategy that’s worked well for this San Diego publisher of materials for the deaf and hearing-impaired market since its beginning in 1979. Nathan offered advice when Dannis expressed concern about competing with mainstream publishers. “Find a back door,” he remembers her insisting. Today, all DawnSign’s original titles are still in print, and virtually none of its sales are direct to traditional bookstores; 95 percent are to wholesalers and the other 5 percent are to end users through its Website. “Our highest B2B sales are to university-level bookstores, and we also sell to educational programs, school districts, libraries, deaf service organizations, and even federal and state level government groups,” says Joe Harrison, a marketing staffer. The company now offers 83 of its own titles and 16 that it distributes for other publishers. Its products range from the expected—titles like Signs for Me: Basic Vocabulary for Children, Parents & Teachers, co-authored by Dannis; and Interpreting in Medical Settings, which is approved for interpreter continuing education units; to such professional resources as Listen with the Heart: Relationships and Hearing Loss, by clinical psychologist Michael Harvey; and Part of the Group: Games That Increase Social Understanding, by researchers at the University of California Center on Deafness. Her comment was echoed by the marketing staff, with Harrison one of those citing the work necessitated by frequent changes in media. It’s been especially time-consuming with some older publications, he says. However much work evolving technology creates, it’s among the reasons that DawnSign has been successful. And the pursuit of new technology is part of Dannis’s pioneering attitude. “We have to always be on the lookout for the next wave of new ideas,” he said when participating in a PBS Small Business School episode a few years ago. One result of that awareness has been the increasing popularity of ASL among the hearing population in the last two decades. “Educating hearing people has positively changed their attitudes and their respect for deaf people, the deaf culture and language,” he explains. As Tina Jo Breindel, who handles community relations, notes, “Census Bureau data shows that ASL is the leading minority language in the U.S. after Spanish, Italian, German, and French.” Between half a million and two million Americans use ASL, she says, and there’s also a sizeable market in Canada. This has led to more opportunities in ASL-related fields for both the deaf and the hearing. 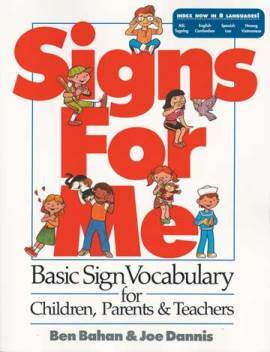 “And more deaf children learn language early because families have the materials to teach ASL at home,” she adds. DawnSign has business challenges identical to those that face most other publishing companies of its size, as well as challenges specific to serving a niche market. Another early problem was growing pains. “It was difficult moving to a new space every few years when we were growing rapidly,” he says. Schlegel and Dannis also cite the continuing headache of retail sales and returns, but like other publishers, DawnSign sells shopworn copies at a discount or donates them to charities. The publisher’s most unusual challenge may be hiring and developing employees who are bilingual/bicultural—people who can both sign and speak and are comfortable in both the deaf and hearing communities. Staff members, 13 of whom are deaf, have to be able to represent the company, and sell to both the deaf target markets and the mainstream business environment, Dannis emphasizes. All employees use ASL. “Given our unique environment, our employees do tend to have longer tenure,” he reports. “Almost all our managers have worked their way up to their current positions, and approximately half of our current employees have held various job titles.” Ryan, for example, joined the company in 1996. Schlegal, who had been a consultant since the beginning, came on board full-time in 1999. This decades-long commitment to the DawnSign mission truly is reminiscent of America’s pioneers, many of whom persevered year after year despite obstacles that were different—but perhaps no less daunting—than the challenges this company has overcome.